I made the Targeted Teaching Manuscript Handwriting Lessons to break the act of writing letters into steps. In addition to breaking down the parts of the letter, I have grouped the lessons by letter shapes. With these print-outs, the child practices writing the shapes of the letter before writing the letter. Very Large Rule: The rule height is approximately 1 1/2 inches. 5 Groups: The lessons are divided into 5 groups. Each group contains letters that have something in common. Group 4 contains the letter Ss, k, and Zz. These letters do not actually have much in common except that they are sometimes difficult. Entire Lesson or Not: Each Lesson, or most of them, have two letters. You do not have to teach both letters in one lesson. You may teach only one letter on one day and save the other letter for the next day. Lessons in a Page Protector: Some have told me that they place the printables in page protectors and the child uses DryErase markers to practice. The child should trace all of the letters and shapes starting at the ball. In the empty spaces the child should attempt to write the letters on his own. The educator should supervise the child as he writes to be certain that he is doing it correctly. On Being Teacherly - Use a white board or chalk board to show your child how to write the letter(s) and tell your child the names of the letter(s) being presented. Write very large and, if possible, allow your child to write the letter(s) very large on the board too. The goal is to concentrate on the shape and direction of the stroke. Once you have done that, give your child the worksheet. Tell him again (or ask him) what letter he is writing and observe him as he writes to make sure that he does it correctly. Choosing Lessons - Choose the printable based on the particular problem that your child is experiencing with his handwriting. Or if you want to start from the top, present the lessons to your child in the order in which they are linked. *The A uses 2-strokes instead of the traditional 3-strokes. The Targeted Manuscript Handwriting could be a follow-up to the Printing Readiness tracing shapes handwriting lessons. 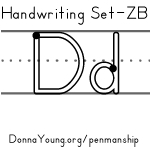 Another set that uses a "targeted method" is the large set: Donna Young's 133 Manuscript Handwriting Lessons for Beginners and that large set could follow this set. ZB Manuscript Handwriting Worksheets - The largest set of handwriting sheets that I have and quite possibly on the internet.